Julian is an alum of Presby Boys Secondary School, Legon. He holds a B.A. in Business Studies at the Kensington College of Business, London, a Diploma in Journalism at the Writers Bureau College of Journalism, Manchester, UK, Executive Diplomas in Strategic Management and Management, a Diploma in Management Studies and an Executive MBA at the Huddersfield University, UK. He has worked in several management positions in the UK and Africa and wants to see Africans do a lot more for themselves rather than relying on the IMF and other donor agencies by developing their human capital. He speaks three languages with a rudimentary knowledge of German and has traveled extensively around the globe spreading his poetry messages and helping out with business solutions. 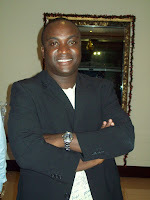 Julian is also the proud author of two bestsellers, namely Smile Africa and Recall, which are both available on amazon.com, bn.com, borders.com, and in major retail outlets around the globe. Julian is a co-founder of One Ghana, One Voice. 1. This is the second of your poems that we've published that has dealt with mothers and/or motherhood. Is this mere coincidence, or is there something about your mother, mothers in general, or the idea of motherhood, that you are particularly drawn to? For me, life begins with motherhood and thus every good mother is a royal who is hailed anytime I get the chance to do so. My mother is the complete epitome of love and dedication as she has done so much for me from the day I was born, breastfeeding me all the way till today... We are constantly viewed as babies by our mothers so mother in the world have something special that we need to constantly talk about. I therefore appeal to all men to treat good women gingerly, and with respect. 2. Do you read your poetry aloud, either at readings or to friends? If so, how does this affect your writing? I often read my poetry to friends and sometimes at readings as I intend to come up with dub poetry in the near future where my poems would be backed my instrumentals and put on CD for sale like one of the greatest poets in the world today, Mutabaruka, does. It certainly affects my poetry as I often accommodate comments both negative and positive and change style accordingly. 3. What, generally speaking, is the initial spark for a poem for you? Do you start with a line, an image, a theme? For me the spark is a combination of image and theme as makes the writing of the lines so easy. Great Minds as we know always visualise. 4. When in the early writing of a poem do you know that it is worth keeping and working on more? After writing the first 3 lines, I know whether it is worth going on or time to halt the process. 5. Anything new and exciting happening in your writing life? I am still working on my first novel "the graveyard", am still doing my management consulting, and am venturing into entertainment, too. In December I travelled to Equatorial Guinea, where I witnessed the inauguration of the President and also organised some musicians from here to perform there. It was an exciting experience. It is always good to dream big as the oceans themselves! There is so much happening but I cannot obviously put all of it into the public domain at this time. Julian...........I love it! So moving and such movement....the opening lines got me "My mother was born on the other side of the oceans, with such a pretty sheen she came into this world a true goddess of beauty"